Let’s face it – chicken can be boring. 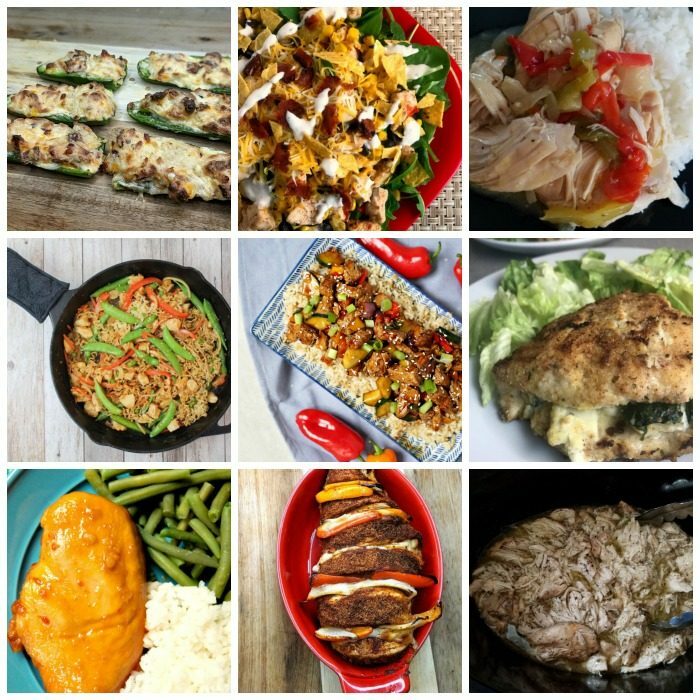 That’s why I pulled together another list of Weight Watchers Chicken Recipes to help you add some flavor and variety to your meal plan. You don’t have to get stuck eating the same things over and over again. The list of recipes below will give you some fun options that are family friendly and low in points. One of my favorite things about WW FreeStyle Plan is that chicken breast is a zero point food. That means I can build amazing meals that I love around a zero point food without feeling deprived. In our house, chicken breast is preferred by me, but my husband likes chicken thighs. I can easily mix it up a bit and serve him chicken thighs in these recipes instead but still keep mine lower points. 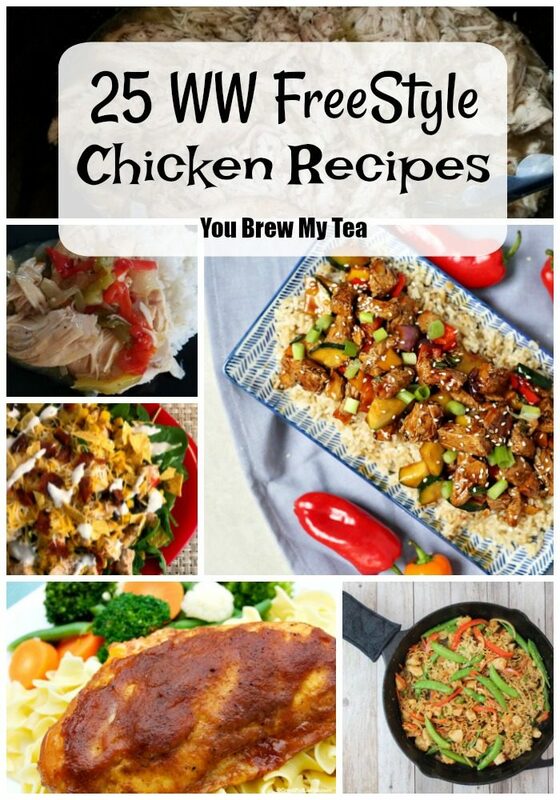 We love this list of Weight Watchers chicken recipes, but I understand how some want different things. So, below you’ll find a few more of our favorite recipes that make following the WW FreeStyle plan easier. I love the fact that WW allows me to eat anything. All I have to do is just track my meals. If I want something different, I can just make room for it in my day and use my points in a way that makes me happy! The internet is flooded with an overwhelming amount of information on what types of chores are appropriate for what ages. Some of these ideas are unrealistic and others well, are pretty underwhelming. There are many things that go into determining the perfect chores for 5-year-olds but, that is a whole different post. Here I will be sharing with you my list of ideas that work well for a 5-year-old. Chore charts are a kid-friendly version of a to-do list. Chore charts give your kids a visual of what needs to be done daily instead of just hearing us bark orders at them. These daily lists can be made by using either pictures or words depending on your child’s literacy level. The visuals will let them know exactly what is expected of them and a sense of accomplishment when they can check things off. 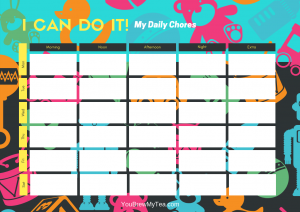 Pick a set of chores that you want your child to accomplish daily. The above list of 20 is way too many. 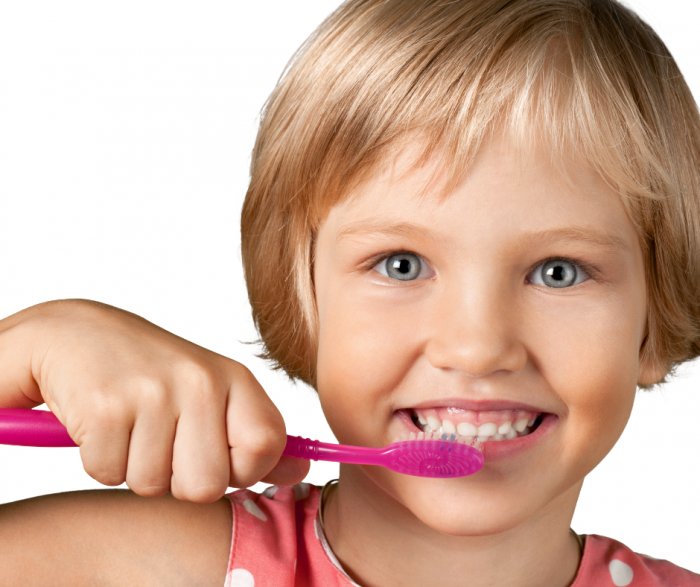 Ideally, you would like 5-7 things on your 5 year old’s daily chore list. Pick chores that work for your family and that you feel can easily be accomplished by your 5-year-old. I’m sure your eyes just got really big just reading that title. Are you thinking ‘I’m going to go broke rewarding my child daily’? Don’t worry though. You won’t. Rewards don’t have to cost you anything. Yes, the occasional nicer reward may be great but, you can mostly stick with free or close to free things. If your child finishes their chores that day (or the consecutive number of days) they can pick something from your approved list. 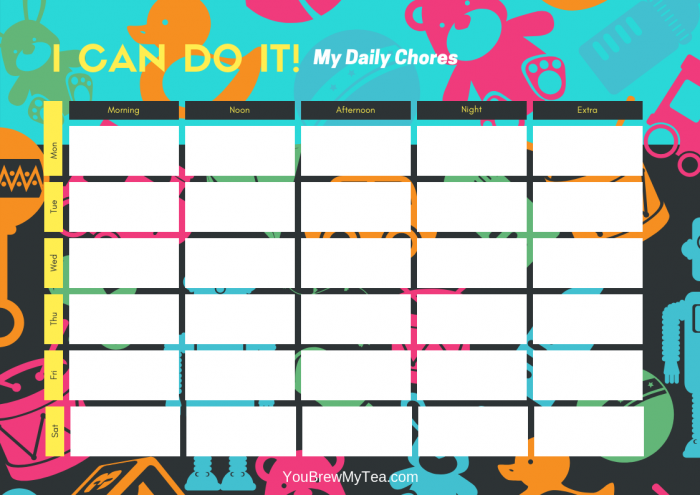 Click the image below to print your own chore chart to use with your child! Fill in the blanks and mark them off as they are completed! These chores and rewards are just ideas to get you started. If you find something that really excites your child find a way to work that into their rewards. The best way you can possibly get them excited to check things off is if they are truly excited to do it. Remember that being consistent will play a huge role in having a successful set of chores for your 5 year old. It is so easy to get lost in Youtube videos, and our kids do it all the time. That’s why I wanted to share some of the Best Youtube Channels for Kids with you. We have all gotten lost in watching Youtube videos at least once but come on be honest here, it happens more than you would like to admit. Youtube doesn’t have to be about going down the rabbit hole. It can be a very useful tool for your kids and their education or curiosity. This list includes some of our personal favorites as well as a few recommended by other parents. 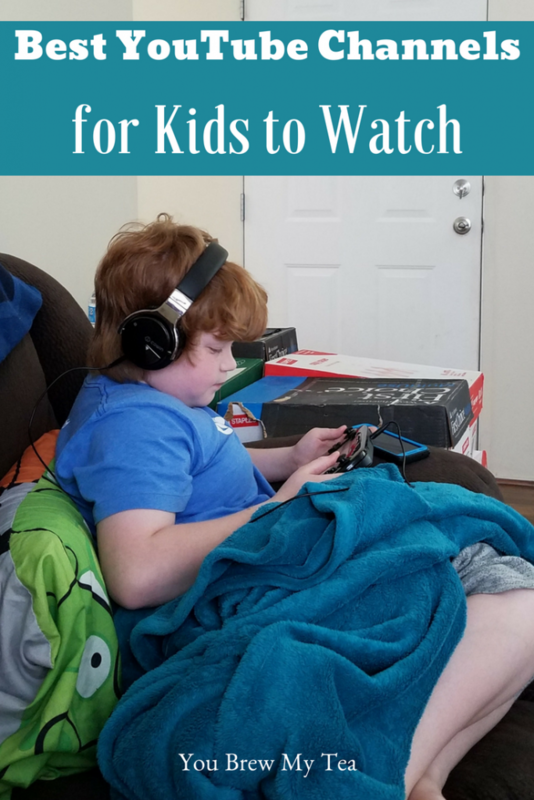 We love using Youtube in our homeschool classroom, but it can also be a great way to have screen time for kids that we can easily monitor. Mother Goose Club is a great way to introduce infants and toddlers to nursery rhymes. There are 6 adults and children in colorful costumes that help keep kids attention. It offers short episodes that last 1-2 minutes or you can watch their pre-created playlists that last around 30 minutes. Coma Niddy is great for the older kids and tween crowd. Mike Wilson who is Coma Niddy, raps about educational things to help kids get a better concept of them in a fun and easy to remember way. SciShow gives kids the opportunity to explore things they may have always wondered about and get the answers they have been looking for. Minutephysics is another perfect one for the older kids and tweens. Illustrations and voice-overs work together to teach kids a wide range of complicating science concepts by breaking them down and making them much easier to understand. Geek Gurl Diaries teaches girls in the older kids, tween and teen age ranges that software engineering and computer programming can be fun and easy to do. They can learn everything from how to read computer language to the basics of programming and even how to build a computer. Smart Girls is run by actress Amy Poehler for tween and teen girls. She interviews female celebrities, shares vlogs, shares what life is like for girls around the world and more. The Brain Scoop is geared towards older kids and tweens coming straight from behind the scenes of Chicago’s Field Museum. It covers everything from animal prep to the concepts of earth science. Each episode has a disclaimer for the gross factor and viewer discretion so you can be sure that your child is watching something age appropriate. Word World PBS is great for preschoolers who are working on letter recognition and literacy concepts. It’s an animated show that brings words to life. Ted Ed is made for inquiring minds. This channel challenges kids with mind-bending riddles, allows them to examine nature, and contemplate unanswered questions. Simple Kid Crafts is built around art projects for young kids. Some of them you may have the supplies on hand and others you may need to pick them up but, either way, this is sure to keep your kids busy. Nerdy Nummies is a family friendly weekly youtube show that teaches kids and their parents how to bake many different types of items. Kids TV focuses on preschoolers and teaching them the important concepts like ABCs, numbers, colors, and shapes just to name a few. DanTDM is all about gaming, and while not educational, it is a great fun channel that is parent approved. Early videos have some language, but we love that Dan soon realized he has a ton of kids watching his channel and has kept everything kid-friendly since then. Minecraft, Roblox, and more are explored. We even bought the DanTDM tour DVD and have picked up various other coloring books and such in the past as he is so fun! Finding the best Youtube channels for kids is easier than you think. You can always set up parental controls and make sure their time is restricted if you are concerned about them finding something you aren’t approving of them viewing. We’ve found that most of the time as long as we keep their subscriptions to channels we approve of, they watch only those. 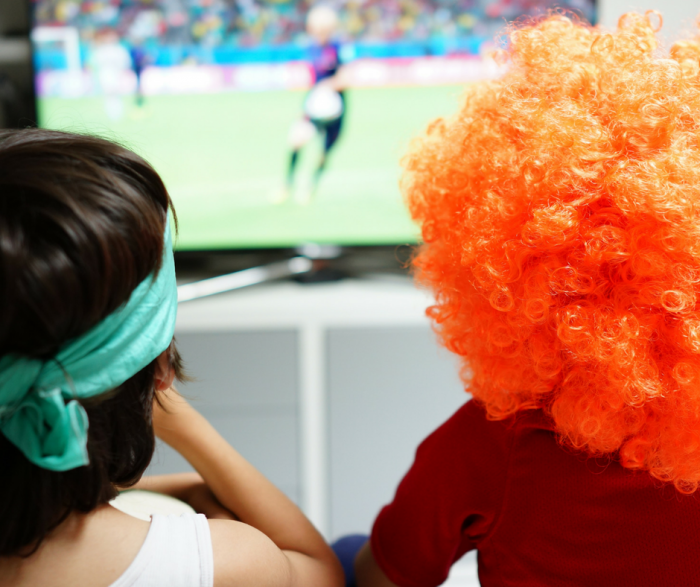 Give your kids a great variety of channels to view, and they will love screen time! Come warmer weather and summer, one of the most popular destinations to spend the day is the beach. 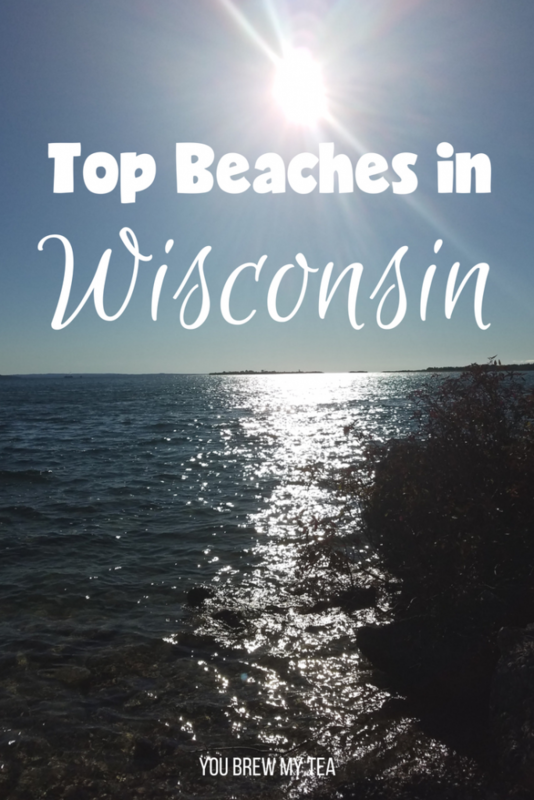 No matter where you live, there is sure to be a beach somewhere nearby, and these Top Beaches in Wisconsin are some of my personal favorites! There is nothing better than spending the day on the beach either with my family or with friends. One of the favorite ways to spend a summer vacation is to visit the beach. While many think only of places like California or Florida, we know all too well those smaller lakes or even the Great Lakes can be amazing beach destinations. We use Booking to snag deals on hotels but have also had great success with Groupon for deals on resorts near lakes. If you prefer to camp, we have tonGroupons of tent camping tips and tips for camping with toddlers that might be helpful. La Pointe Wisconsin is the home of the Apostle Islands chain. One of those islands is Stockton Island which is well known for its beautiful beaches. Julian Bay is the most well known of those beaches. Julian Bay Beach is Certified Blue Wave and is unique because of its ‘singing sand’. If you run your hands through the sand on Julian Bay, it makes a whistling type sound. This is not just one of the top beaches in Wisconsin, but one of the best you will see anywhere. All of the Islands within the Apostle Islands chain have fabulous beaches. Some are more well known than others but, each and every one of them are worth a visit. Just remember they are only accessible via water so pack all necessary items. Baraboo is home to some beautiful landscapes. Devils Lake State Park is the perfect example of what you will see in the area. Devil’s Lake is known as the perfect destination for rock climbing and camping in Southern Wisconsin. On top of those things, it is home to some of the most beautiful beach shores as well. Devils Lake State Park offers two beaches. The north beach fills up quickly and the south beach takes the overflow. Both of them offer the same things but, the timing of the sun is different due to the locations. It should be noted that neither beach offers a lifeguard. 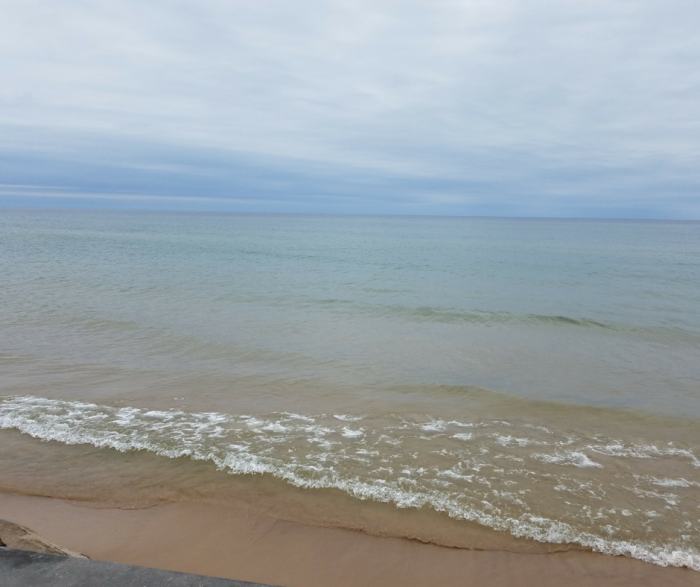 Racine’s North Beach is Certified Blue Wave and has made the top of many best beach lists. There are so many reasons to visit North Beach. For starters obviously is the gorgeous scenery but secondly, they are the perfect family beach. Kid’s Cove is a nautical themed playground adjacent to the beautiful beach. Plus, lifeguards are on duty daily from June to September. Just outside of Two Rivers Wisconsin you will find Point Beach Forest. While it offers campsites and hiking trails, it also offers a few miles of beach. Point Beach never really feels crowded because there is plenty of room to spread out. The beach may not seem any more special than the next but, here you will find the Rowley Point Lighthouse. This lighthouse is owned and operated by the coast guard and has been that way since 1853. Hidden inside the bustling city of Milwaukee is Bradford Beach. The beach is a popular retreat come summer time so it may be a tad bit crowded but so worth the visit. Bradford Beach is home to the Water and Air Show and very well known for its volleyball tournaments. It offers tiki huts, a bathhouse, and concessions. From Mid-June to Early August Bradford Beach is staffed with a lifeguard from 11:00 am to 5:00 pm. During these hours inflatable devices are not allowed due to how crowded the water gets, however, Coast Guard approved flotation devices are okay. Egg Harbor Beach is a very popular beach and park area in Door County. The beach area is only 500 feet long so it is just a tiny part of the park area but it sure is a wonderful area. The beauty of this beach is that there are small trails that connect it to downtown Egg Harbor so you can walk from the beach to a restaurant or store and back without taking your feet out of the sand. The Mississippi River runs through five Wisconsin towns (Stoddard, De Soto, Ferryville, Lynxville and Prairie du Chien) . This is called the Great River Road. Each of these towns offers different scenery and experiences. No matter which town you visit, the beaches and sandbars in the Mississippi are something that everyone should experience at least once. It is such a unique experience. At times during the year the sandbars are lined up just right so you can wade from one side to the other and the water only comes to your knees. There are beaches all over Wisconsin. Some are in the most unlikely places yet, they may offer the best beach experience you have ever had. Whether the beach is well known or way off the beaten path Wisconsin Beaches always offer beautiful and relaxing scenery. Even if you only have a few minutes, take the time to stop and just take in the views. You are sure to not be disappointed. Screen Time. Oh boy. There is such a wide variation of what screen time is used for. Everything from school to passing time, that’s why some parents will find it useful to see some guidelines of Common Screen Times for Tweens. The most common type of screen time you hear about is screen time limits for the younger kids. It is important to continue to adjust those screen times as your child gets older. Even tweens should have some sort of a limit to how much screen time they can have. With phones, tablets and computers so easily accessible it is easy to rack up screen time hours pretty quickly. Especially when the screen becomes a necessity in your child’s education. Whether we like it or not screens are an important part of our daily lives. Below are some of our screen time boundaries for tweens. There is no secret that screens play a big part in our kid’s education. This, however, doesn’t mean that we shouldn’t limit the time spent on the educational apps outside of school. I am more lenient with educational apps but, we do still set limits on them. It is important to check and make sure that they are staying within the educational apps. If they have veered out of the app into something unrelated, screen time is deducted. There are several apps that have no educational use whatsoever but, are purely for entertainment purposes. I love these apps for absentminded entertainment. Which we all need once in a while. Our screen time limits are much more structured when it comes to these apps. These are less monitored as it’s meant to just be a distraction or a way to wind down. Anywhere from 30 minutes to 2 hours per day could be okay for your child. This greatly depends on the day of the week, if they have completed chores and homework, as well as if they are homeschooled. I much prefer seeing my kids outside playing, reading a book, or engaging with the family, but apps like these are ideal for when you are traveling, in between chores, or just need to relax. 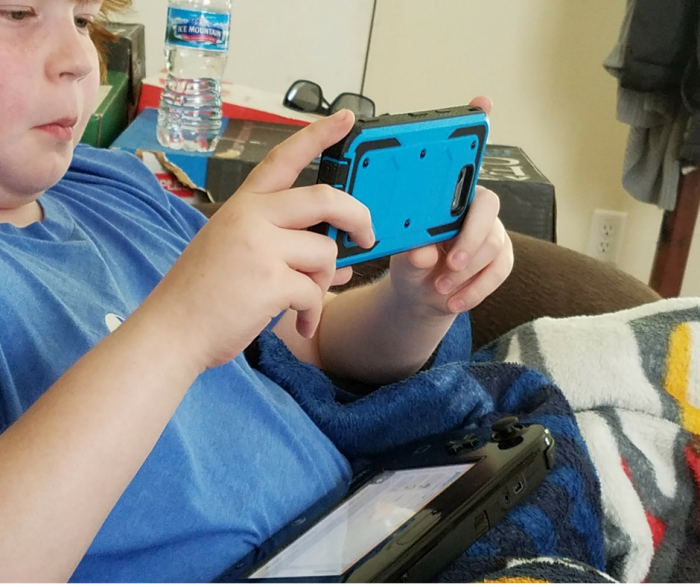 When it comes to needing to use screen time for school I place little limitations on this. We do check in on them unannounced to make sure they are focused and using only what is needed to complete their assignments. Up to two hours per day using educational apps is okay in my opinion. Especially if you are homeschooling and using these to help supplement your curriculum. Otherwise, on school days I would limit to 30 minutes maximum. On weekends these times can vary depending on your routine and the individual child. No matter what the screen time limits are, it is important that you set the boundaries clearly and you are able to check in on that. 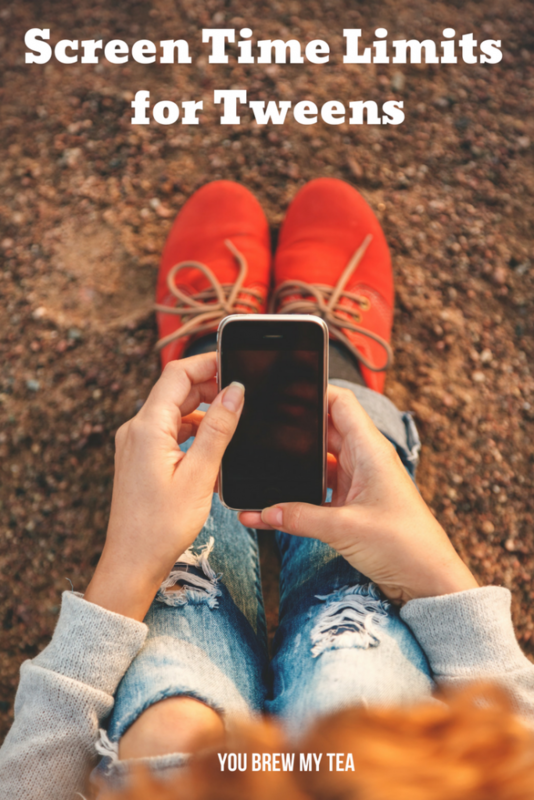 If you feel like you need to keep a very close eye on what apps and websites your child is visiting there are programs that give you a report of what is being used. No matter what means you use to hold your child accountable, it is important that you stay consistent.